Once a year, professional arborists from around Portland and beyond gather up their tools and come to Hoyt for the annual Arborists in the Arboretum. Lending their experience and expertise in the careful care of our collections, we are thrilled to host this boisterous group of colleagues and are amazed at the skill and accuracy with which they do their work. While this event is closed to the public, feel free to stop by and watch them work – from a safe distance – in the collections. They will be visiting us again on Saturday, September 7, 2019 from 8am until 12pm. Thank you to everyone who helped make the 31st annual Arborists in the Arboretum a success! On Saturday, September 8, 2018, Hoyt Arboretum Friends hosted Arborists in the Arboretum, where professional arborists from the Portland metro area and beyond volunteer their time and expertise to care for Hoyt Arboretum’s trees. This year, 98 arborists representing 36 companies volunteered for Arborists in the Arboretum. 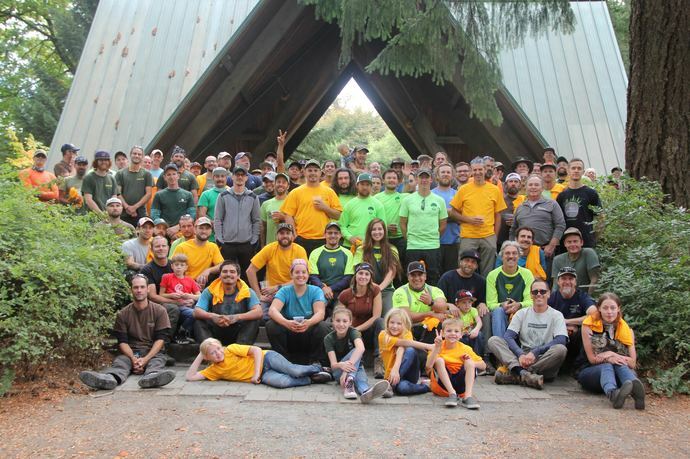 We want to express our sincere thanks to the generous arborists who keep Hoyt Arboretum growing year after year! See photos from Arborists in the Arboretum 2018.